So you've got some grimy, greasy hair. Why not reach for dry shampoo? Duh! Dry shampoo is a huge trend right now seeing as more & more people are becoming aware that washing your hair every day can do more harm than good. That's where LUSH No Drought Dry Shampoo comes into the picture. I was at LUSH & I happened upon it so I decided to make the purchase. This dry shampoo retails at $13.95 for 1.9 ounces. 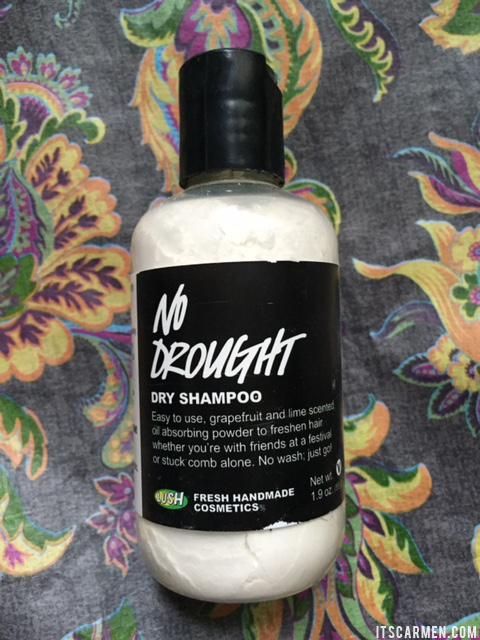 No Drought contains 100% natural ingredients, preservative free, plus it's vegan! One of my favorite aspects is the light citrus fragrance, likely due to the grapefruit & lime essential oil. I use this dry shampoo pretty often; it effectively makes my hair look less gross & suitable for public viewing. I have dark hair, so with a light hand you won't see any residue in your hair. My boyfriend also likes to use this -- he sported it religiously at Coachella & I thought he looked very handsome. LUSH No Drought Dry Shampoo is easy to use, freshens your hair, & gives you peace of mind. No need to shampoo your hair every day! Thanks for the review!!! Great product! 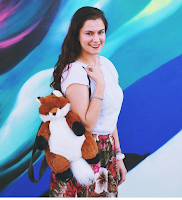 Dear Carmen, thank you so much for sharing! I've always searched for something organic like this! But couldn't find it in our drugstore! Gotta have this one by LUSH! I think I'm the only Lush virgin left in the world. I've never tried any of their products - I really need to do something about that. Very interesting stuff. Hmmm...it does make so much sense too. Thanks Carmen. I've been wondering about their dry shampoo. Happy to read a positive review! Thanks for a great review, Carmen! :) I never tried a dry shampoo before, but I would love to try one. I went through a phase of using drug shampoo because I lazy & trued putting off washing my hair for as long as I could haha But I stopped because it felt dirty to leave that gunk in your hair. 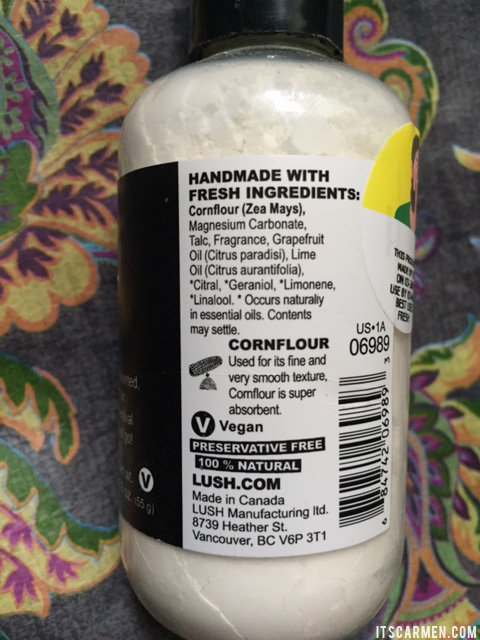 I’m going to have a look for this next time I’m near a Lush store because I don’t think I’d have any qualms with leaving natural product in my hair haha Thank you so much for sharing this! I use it for years and live it. My one complaint is that because the bottle is so huge it isn't very travel friendly. so I carry another brand in my purse for touch-ups on the go. I use Batiste dry shampoo since I find it easier to apply. I don't know if this will work but I will try it for sure! I just wanna try everything Lush, and this too! thaks for the review :) I've dark hair too, and I'm looking for a good product :) I'll check this out! I've wondered about dry shampoos. It looks like fun! Great post! I cannot praise this dry shampoo enough - I will never go back to spray cans now! How do you like this dry shampoo? I tried dry shampoo ONCE in the. It didn't work well, or at all, so I swore off the stuff for years, despite all of the hype. 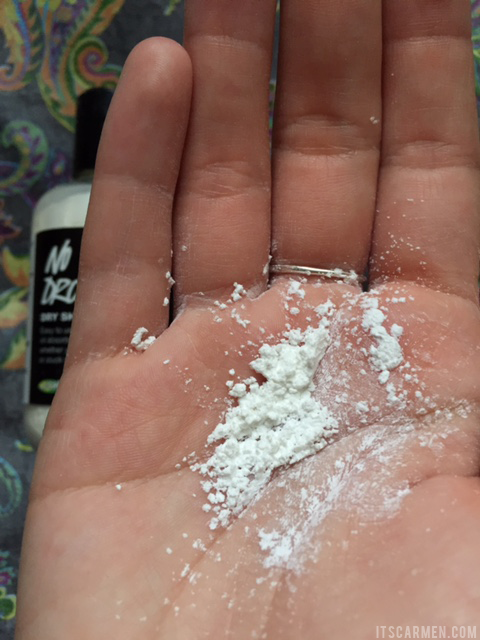 But if you swear by this stuff, and I've only heard great things about Lush products (I need to try a bath bomb too! ), I guess I will need to stop by there this weekend and give it a go. Thank you for the recommendation!! I'm not a fan of dry shampoo but I use Oribe Texturizing Spray that works almost like a dry shampoo... but leaves the hair even prettier! I haven't used this but I'm always on the lookout for a new dry shampoo so I'll have to give this one a try when I run out. Thank you! I have this product too, but since I haven't tried any other dry shampoo, I can't really compare it to anything. I think it get my hair a bit sticky, and clogs my scalp. And, it doesn't last very long, after a few hours it's still obvious I didn't wash my hair. Did I use it the wrong way? Maybe I should apply before my hair starts to get oily? Seems like everybody is loving this. No Drought is one of my favorites! I also really like the Drybar's dry shampoo. This stuff is so great! Lush is such a wonderful brand! I've heard good things about this dry shampoo but I don't like the dispenser I think it create a messy appearance. I'm a huge fan of the Oribe dry shampoo.